This week the world celebrates Ganesh-Utsav, the celebration of Ganesh; the most joyous celebration of the Indian calendar. Ganesh or Gan-Ish literally means “Ish” or Lord God of the “Gan” or common people. Every year the arrival of Ganesh beings festive joy to Indian households worldwide. Ganesh is the giver of Buddhi which is the seat of cognition & intelligence, a much higher state than the mind. The separation of Buddhi from mind is the origin of Yog and a central concept in Indian thought. In fact, the separation of Buddhi from mind is one of the earliest distinctions between Indian thought & Greek-European thought, a distinction that dates back to Plato and pre-Plato. The achievement of the final stage of Buddhi is what made Gautam into Buddha. Ganesh is also Vighna-Harta, the remover of obstacles. That is why people pray to Ganesh before beginning any new journey, project, or assignment. The message of Ganesh is universal and He can be reached by any devotee of any religion, ethnicity, national origin or color as long as their hearts & minds are clean and devoid of malice. And the first step towards removing malice is to eradicate misrepresentations & embrace the true meaning. The physical form of Ganesh is a Moorti (or Murti) and not an idol. These days you hear idol and you tend to think of an Apple doll like ipod, ipad, iphone. In reality, there is a ginormous difference between the concepts of Moorti and idol. In fact, European philosophy and the English language have no words to define the concept of Moorti. Moorti is an instrument for making an A-Moort (अमूर्त) or intangible entity into a Moort (मूर्त) or tangible form. Indian Dharma has always defined the Ish or the Lord/Creator of the Universe as beyond comprehension, beyond description and beyond the ken of human understanding. This appeals to philosophers & pandits, not to devotees who approach the Ish with joyous devotion. A central concept of Indian Dharma is that the Ish or the ultimate God is reached and visualized through deep worship and prayer. And the Ish or God appears before a devotee in the form in which the devotee sees the Ish. In other words, the Vi-bhooti (विभूति) or form of the Ish is in the eye of the beholder. It follows that the Vi-bhooti or forms in which the Ish can appear are infinite in number. After all if the Ish or God had only a finite number of forms or Roop, then God would be a finite entity and not the beyond infinite, all-encompassing Creator Ish or or Lord. That is the reason you see such variance between the different Moorti of Ganesh. They are all equal and identical because they have all sprung from the devotion of their sculptors/painters/artists. This is the first significant difference between a Moorti and an idol. The second is equally critical. The word idol is European and derived from a Greek-Latin heritage. Therefore the concept assumes that different idols are distinct. Because the various gods in Greek thought were distinct and independent of each other. Ganesh is a uniting figure. All forms of stratification, Jaat or ethnic community, social status, economic status, melt away before Ganesh and everybody becomes a member of the “Gan” or followers of Ganesh. He is the Ish & we are all his “Gan”. Ganesh was the central Moorti of worship in the Marathi Peshva regime of Pune. They might have been the first regime to do so. 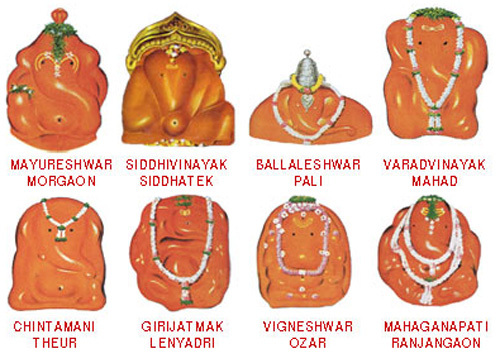 They established Ashta-Vinayak or 8 major centers of Ganesh worship in the state of Maharashtra. To this day a pilgrimage to these 8 centers is an important milestone in reaching God. But look at the map of these 8 centers (marked in red) and you notice something else. These 8 centers essentially form a perimeter barricade* against approaches to Pune from the North, West & East, the three areas from where an enemy force could threaten Pune. With a steady stream of visitors to these major temples of Ganesh and with regular large festivities, these 8 centers formed an early warning system to protect the capital of Pune. Look at these original Moorti that adorn these 8 centers. You will see that they are closer to the Nir-Aakaar & Nir-Gun (without properties, without form) concept of Ganesh. Given this heritage, you can see why the Great Lokmanya Tilak, the guru of Mahatma Gandhi & the first truly national leader, used Ganesh worship as a central tactic in his drive to unite India against the British occupation. The British had banned mass gatherings to prevent any chances of people rising against them. So Tilak came up with the idea of celebrating Ganesh as a mass public event. Below is a photo of his first public Ganesh celebration in 1893. This strategy of Lokmanya Tilak succeeded beyond perhaps his own dreams. 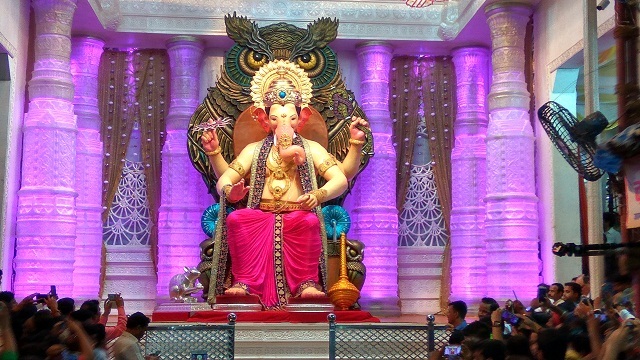 Public celebration of Ganesh has now become huge in Mumbai, all over India and now globally in the Indian disapora. And it retains the original characteristic of bringing all people together. 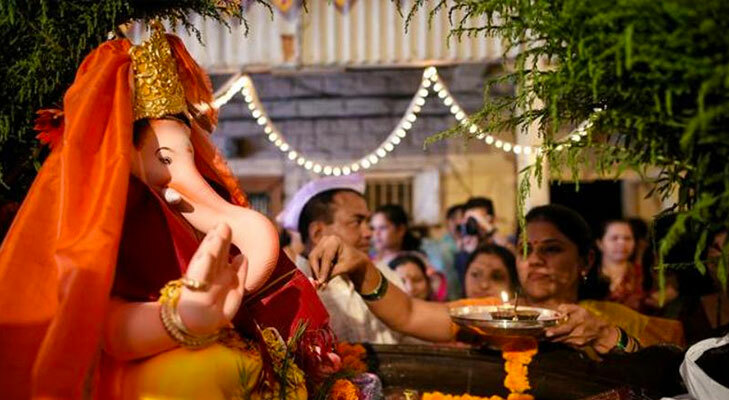 We hear that even Muslims in Mumbai have begun participating in Ganesh celebrations. 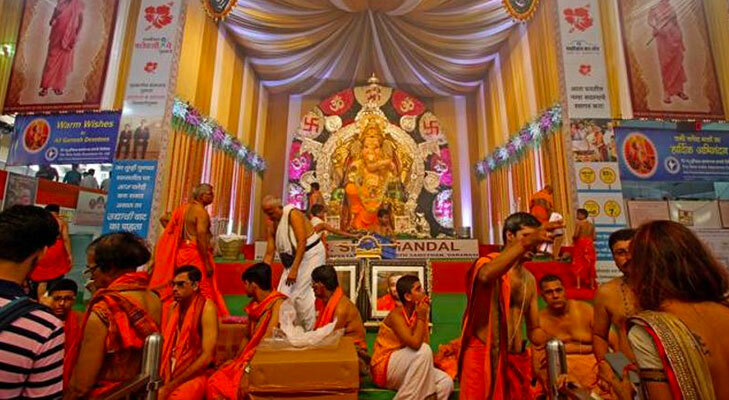 Every neighborhood in Mumbai celebrates Ganesh-Utsav in its own way with its own Moorti. We must begin first from where it began under Tilak – Keshvaji Naik Chaal in Mumbai. From there we jump to the most well known Ganesh Utsav of Mumbai – the Lord of Lalbaag. The throne of the GSB Ganesh Moorti is a 17 kilogram Silver throne, a gift from a devotee. Before you saw “wow”, this year’s Moorti is reportedly adorned with 68 kilograms of Gold and 315 kgs of Silver. And keeping with its 62 year tradition, the Moorti is made of environmentally friendly shadu clay. They insured this Moorti for $45 million (300 koti rupees) either a big figure or a small figure depending on your vision. If this is the scale today when India is just beginning to get prosperous. imagine the scale the Utsav will reach when India does become the 3rd largest economy in the world 20-30 years from now. Actually think of this the right way. Meaning the Ganesh Utsav and other festive celebrations are a big factor in India’s GDP growth. Look at the Ganesh Utsav from an economist’s eyes and you will see a burst of consumer spending on jewelry, on new clothes, on food, on lights & parties. The velocity of money, a key driver of GDP growth, explodes during massive national celebrations like Ganesh-Utsav. Joyous coming together of all people in unity, families, neighborhoods, cities & country coupled with a big stimulus to commerce & economy with an explosion of velocity of money – If that doesn’t make a society successful, what can? In the UpaNiSad texts of Indian thought, Ganesh is deemed as the Sound that began the Universe. 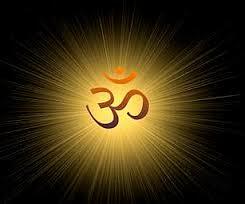 The Om sound is shown below in its classical form and then as Ganesh form from Bali & Java in Indonesia. Remember that every major journey is begun with an invocation to Ganesh as Vighna-Harta, the remover of obstacles. Such a journey began in Maharashtra in the 13th century to remove social orthodoxy and to bring to the common people in their own language the true Indian Dharma of the Bhagvat-Geeta. This movement was launched by a teenager who since then has been called the Dev of the Truly Learned. This movement named Bhakti-maarg (the road of devotion) was developed and enriched by Saints over the next 400 years and led to the freedom of Maharashtra & India from Muslim rule and then via Tilak to the end of British occupation.